The field of teaching digital electronics has not changed significantly in the past 20 years. Many of the same books that first became available in the late 1970s and early 1980s are still being used as basic texts. In the 20+ years since these were written, the basic rules have not changed, but they do not provide strong links to modern electronics including CMOS logic, Programmable Logic Devices and microprocessor/microcontroller interfacing. Courses teaching introductory digital electronics will fill in the missing areas of information for students, but neither the instructors nor students have resources to explain modern technology and interfaces. 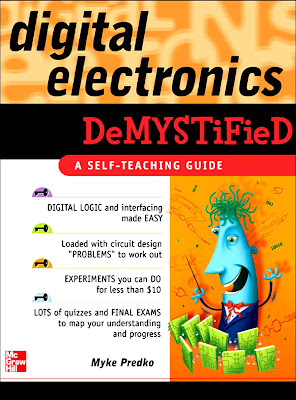 One assumption made by all the standard texts is that experimenting with digital electronics cannot be done easily - in the proposed book, “digital guru” Myke Predko will show how readers can set up their own apparatus for experimenting with digital electronics for less than $10. El campo de la enseñanza de la electrónica digital no ha cambiado significativamente en los últimos 20 años. Muchos de los mismos libros que empezaron a estar disponibles a finales de 1970 y principios de 1980 se siguen utilizando como textos básicos. En los 20 años desde que fueron escritas, las reglas básicas no han cambiado, pero no proporcionan fuertes vínculos con la electrónica moderna, incluyendo la lógica CMOS, dispositivos lógicos programables y microprocesador / microcontrolador de interconexión. Cursos introductorios de enseñanza electrónica digital llenará en las áreas faltantes de información para los estudiantes, pero ni los profesores ni los estudiantes tienen recursos para explicar la tecnología moderna y las interfaces. Una suposición hecha por todos los textos estándar es que experimentar con la electrónica digital no se puede hacer fácilmente - en el libro propuesto, "gurú digital" Myke Predko mostrará cómo los lectores pueden crear su propio aparato para experimentar con la electrónica digital por menos de $ 10. PART ONE Introduction to Digital Electronics. The Underpinnings of. Digital Electronics. PART TWO Digital Electronics Applications. The Underpinnings of. Digital Electronics. Boolean Arithmetic, Truth Tables and Gates. The Six Elementary Logic Operations. Combinatorial Logic Circuits: Combining. Logic Gates. Sum of Products and Product of Sums. Waveform Diagrams. Effectively Optimizing Combinatorial. Circuits. Truth Table Function Reduction. Karnaugh Maps. Boolean Arithmetic Laws. Optimizing for Technology. Creating Digital Electronic. Circuits. Basic Electronic Laws. Capacitors. Semiconductor Operation. Logic Gate Input and Output. Simple Digital Logic Circuit Development. Testing a Simple TTL Inverter. Number Systems. Base 16 or Hexadecimal Numbers. Binary Coded Decimal. Gray Codes. Binary Arithmetic Using Digital. Electronics. Adders. Subtraction and Negative Numbers. Magnitude Comparators and Bus. Nomenclature. Multiplication and Division. Practical Combinatorial Circuit. Implementation. Race Conditions and Timing Analysis. Quick and Dirty Logic Gates. Dotted AND and Tri-State Logic Drivers. Combining Functions on a Net. Feedback and Sequential Circuits. Flip Flops (RS and JK). Edge Triggered Flip Flops. Latches Versus Registers. Reset. Oscillators. Transistor Astable Oscillators. Ring Oscillators. Relaxation Oscillators. Crystals and Ceramic Resonators. 555 Timer Chip. Delay Circuits. Complex Sequential Circuits. Counters. Shift Registers. Linear Feedback Shift Registers. Hardware State Machines. Circuit Interfaces. Address and Data Decoders. Multi-Segment LEDs. Pulse Width Modulation. Button ‘‘Debouncing’’. Switch Matrix Keypad Interfacing. Reading Datasheets. Chip Operating Characteristics. IEEE Logic Symbols. Power Usage and Fanouts. Computer Processors and Support. IEEE754 Floating Point Numbers. Memory Types. Power Supplies. Programmable Logic Devices. PC Interfacing Basics. The Parallel (Printer) Port. Video Output. Synchronous Serial Interfaces. (SPI, I2C, Microwire). Asynchronous Serial Interfaces. RS-232 Electrical Standards.